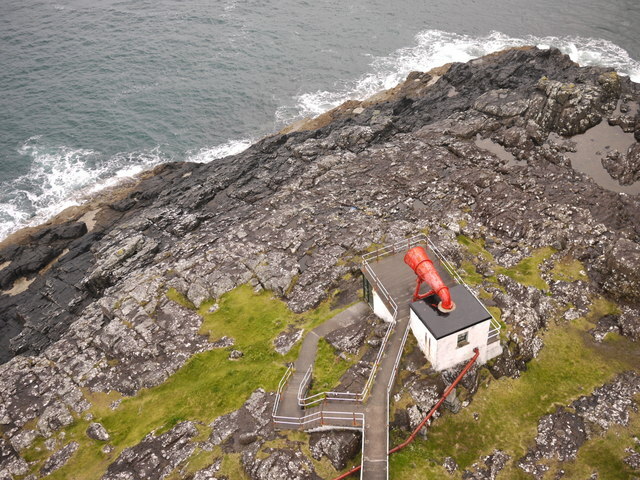 This lighthouse is now open to the public. Although a working light, the local museum trust have come together with The Northern Lighthouse Board (NLB) to arrange for visitors to climb the tower and hear from an NLB keeper the story of the light - much recommended! The foghorn shown no longer operates. As it was explained, shipowners pay the NLB (and Trinity House in England and Wales) light dues to maintain the light system. They told the Boards that they no longer wished to pay for foghorns, since their watchkeepers on board ship were tucked up inside warm wheel-houses and could not hear them anyway.